Nobody can deny the allure of a thick, green forest. Here in Victoria, we’re surrounded by them, whether it’s the drier inland bush like at the Grampians or the beachside heath of Wilsons Promontory. But did you know you can find Californian redwood forests right here in Victoria? Californian redwoods are distinguished by their extreme height (they can reach up to 115 metres tall) and their somewhat horizontal branches. The bark is a bright red-brown colour, and as the name suggests, they are indigenous to coastal California and the southwestern corner of Oregon in the US. These trees are among the oldest living organisms on Earth – so how on Earth did they end up way over in Australia? The story goes that redwoods were planted down the coast in the Great Otway National Park in the 1930s as a softwood logging experiment, but since there’s great fertile foil and great water supply in the Otways, these trees have grown rapidly over the last 90 or so years. Keen to see them for yourself? 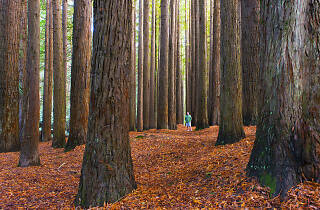 Take a drive down the Great Ocean Road toward Apollo Bay and venture inland towards the Beech Forest. It’s nearby the Aire River and Hopetoun Falls, so you can easily spend a whole day exploring in the wild. For those on the other side of the city, there’s also a collection of redwoods in the Warburton Valley. 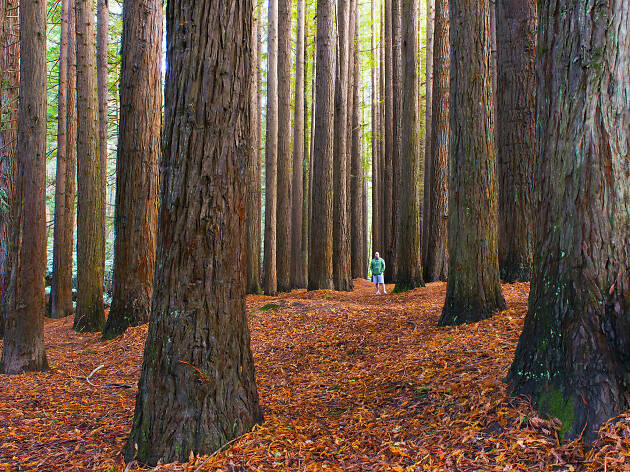 Located just a few kilometres outside Warburton on Cement Creek Road, the redwood forest here was planted around the same time as the Beech Forest redwoods, with further plantings done in 1960. Hop out of the car and take a walk through the grid-like plantation – it includes over 1,400 trees, up to 55 metres tall. Go hunting for more nature with our guide to Victoria's best waterfalls.